From children to teens and adults, Dr. Seim provides specific and custom orthodontic treatment for each patient. When you choose Seim Orthodontics, you can be assured that you’re receiving the best possible treatment in a modern and comfortable environment. Dr. Seim was born and raised in St. Louis and is honored to serve her hometown. She truly loves the people and the community of Lake St. Louis, and is excited to offer tailored orthodontic care to all of her patients. Simply put, Dr. Seim’s ultimate goal for patients is that they’re thrilled with the smile they leave with. Everyone at Seim Orthodontics works as a team to help you get the most out of your treatment and to put a beautiful smile on your face. 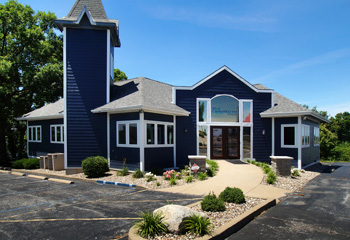 Seim Orthodontics is located on the lower level of a beautiful, newly renovated building, just steps from the lake. When you walk into our practice, you won’t feel like you’re in an orthodontic clinic. The interior design and finishes reflect the serenity and relaxation of the lake. We’ve brought the beauty of nature into the space, making it a pleasant place for our patients. The first floor of the building is occupied by Seim Chiropractic and Wellness, owned by Dr. Lisa Seim’s husband, Dr. Eric Seim. At Seim Orthodontics, we understand that deciphering between different dental specialties can be confusing. As an orthodontist, Dr. Seim completed an additional two-and-a-half year residency after dental school, which dentists do not complete. During this time, she received specialized training when it comes to orthodontic treatment and got to spend more time learning about the best possible practices and care. Dr. Seim is ready to help you and your family experience beautiful smiles for years to come. If you’d like to get started, contact our practice today. We’re here to help and offer several benefits to our patients—including 0% financing, payment plans, 24-hour emergency care, free onsite parking and same day services when available. Get started today!